Welcome to returning subscribers! Thank you for your continued interest and support. I appreciate your time. Welcome also to all the new subscribers this month! I hope you find this issue enjoyable and packed full of helpful information. Contact me if there is information you would like to see in future issues. I'm here to serve you! A Word of Apology: Last month's issue had technical glitches that did not show up in preview mode prior to publication. I apologize that the majority of the text appeared to be text hyperlinks (just about everything was underlined). This was only the second time I've utilized this particular software. Hopefully this will not happen again. I apologize for any inconvenience and/or confusion this may have caused you. Please stay with me during this learning curve! It's October and, for many families, that means preparing for Halloween. Safety Tip #1: Remember the 3 C's Casualness Causes Casualties! Use your common sense. This can help you and your children avoid tragedies. Children can become very excited during holidays: sugar highs, costumes, pretending. Remember what it was like to be a kid? Excitement can lead to distraction. Distraction can lead to accidents of various types. Practice the 4 B's: Be the parent, be responsible, be watchful and be vigilant. Safety Tip #2: Assist In The Costume Choice For your children, deciding what to be this Halloween can be a very exciting time. Kids love to pretend and dress up (and so do some of you adults)! Whether you (or someone else) are making a costume for your child or you purchased a ready made one, help your child with this choice. Make sure it is: (a) Made of flame retardant material, (b) Has eye holes large enough to see well, (c) Does not obstruct the child's peripheral vision, and (d) Allows freedom of movement. Safety Tip #3: Jack-O-Lanterns Carving Jack-o-Lanterns can be a fun craft to share with your children. If utilizing Jack-o-Lanterns with candles inside, be sure to place them far from the door so that you won't have to worry about setting costumes on fire. In place of candles, you can utilize battery operated pumpkin lights. They flicker like candles without the fire hazard. For more information go to: pumpkin lights for these and other Halloween-related items. Safety Tip #4: Check the Props If your child's choice of costume includes a prop of some kind (sword, pitchfork, etc. ), make sure it has a smooth surface and flexible tip(s). That way, no one gets injured if it gets dropped and/or someone falls on it. Safety Tip #5: Pumpkin Carving A basic safety rule here is never allow children to use sharp knives. Do the major cutting yourself. A pumpkin carving kit has small plastic saws that are safer than knives (but they can still cut fingers). Always supervise your childrens' activities. Smaller children can draw the faces and clean out the inside of pumpkins. Consider other alternatives to carving. Try painting a pumpkin or use Mr. Potato Head pieces as an alternative. Pumpkins will also last longer if not carved or slit open. Safety Tip #6: Feed the Children Feed your children a healthy meal before going out to Trick-or-Treat. This provides your children with 2 good benefits: (1) Good nutrition they need anyway, and (2) They are less likely to "pig out" on sweets later. Safety Tip #7: Basic Safety Talk This is a great time to remind your children (and yourself) about general safety tips such as: (a) Don't get into cars with strangers, (b) Don't talk to strangers, (c) Look both ways before crossing streets, (d) Be aware of what (and who) is around you, (e) Obey traffic rules and (f) For older kids (and adults) don't talk on your cell phone while driving! Safety Tip #8: Check It Out Unfortunately, the fun Halloweens of my youth are gone -- you can't give kids hot dogs, hot cocoa and home-made popcorn balls. Always check the treats, especially ones given by people you don't know well. Only accept wrapped candy. Make Halloween safety a priority. Have a fun, safe and happy time with your kids this year. 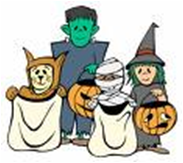 If you would like to learn a little about the history of Halloween, go to: Halloween History. It's October and the weather is still hot (mid to upper 90's) and humid in Texas. It makes it very hard for me to focus on preparing for the upcoming holidays. 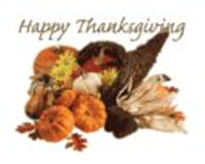 You may also feel like it's a bit too early to think of Thanksgiving, but I wanted to get this information in your hands ahead of time so you can have an enjoyable stress-free, fun-filled time with your family. Cleaning Perform your fall deep cleaning now so you won't have to worry about it during the upcoming holiday season. That's one more thing you can check off your list! For tips on cleaning, check out cleaning tips. You can also check the Fall Cleaning Tips in the archives (September 2008 issue) of Messy Makeover Magazine. Menu Preparation What's on your menu? Whether it's the traditional turkey or ham, or if your family has more exotic tastes, menu planning is still the first step in good holiday preparation. May items (like canned goods) can be purchased well in advance. Some entrees can be cooked ahead and frozen without losing flavor, nutrition or texture. If you have a dish that can be frozen, cook it ahead of time and freeze it. If you're not sure how long items can be frozen, check out the tips on freezer charts and freezer storage guidelines for help. Delegate Items to Others You don't have to prepare everything! Everyone should contribute to the holiday celebration. You don't have to be Martha Stewart and raise your own turkey!! Delegate items on your menu. Even people that don't (or can't) cook can bring chips and dips, bags of ice, a bakery-made dessert or a jar of pickles. Make sure to have a "Plan B" in the event some one forgets their item or doesn't show up. Make Your List & Check It Twice Once you have your menu planned, write out the ingredients for each dish. Check your refrigerator, freezer and pantry for items that you already have on hand. Create your shopping list and purchase what you can ahead of time. If using prepackaged mixes, check the contents and directions for other items you may need (eggs, milk, etc.). Don't forget about items such as plastic wrap, zip lock bags, aluminum foil, wax paper, paper towels, storage containers for leftovers, etc. Decorate Decorating for any holiday is my favorite thing to do! I personally love fall colors and fall decorations! Use a combination of flowers, gourds, leaves and berries (artificial or the real deal) to dress up your home and your table. Scarecrows, dried corn, and horns-of-plenty are attractive as well. Candles are welcoming, just be sure to put them in a safe area away from small children and pets. Never leave candles unattended and always make sure they are not burning before leaving home. If you have a separate dining area, decorate and set the table the night before. It will save you time the next day when things tend to get hectic. Check Your Timing Timing is everything when preparing large meals. You don't want to over or under cook foods or have dishes getting cold (dry, hard, etc.) because another item is still cooking. Write down how long it takes to cook each item on your menu. This will help you time your food preparation so that everything is done around the same time. I hope these Thanksgiving Preparation tips will help you and your family have an enjoyable Thanksgiving holiday this year. My product review this month is about utilizing poly file folders and envelopes. I love, love, love these office supplies for many reasons. As the name indicates, these file folders and envelopes are made of flexible, super durable polypropylene (e.g. plastic). They are waterproof, tear resistant, and come in a variety of bright colors to help you color code your documents. Some have file tabs like regular file folders. Others do not have tabs. Most have a flap that locks down the front part of the folder to keep your papers from slipping out. They even come in expandable varieties for larger volume of documents. The poly envelopes are also very useful. They look similar to the interoffice envelopes utilized commercially and have a string tie that wraps around a poly tab to secure your files. Some have a hook/loop closure. They are also waterproof, tear resistant and come in bright colors. I made good use of these on my honeymoon cruise. I stashed all of the memorabilia for a scrapbook in these folders and they came home in great shape! The poly folders and envelopes are more expensive than the paper varieties. Due to the cost, I don't recommend them for long-term storage of documents. Both Pendaflex and Smead make these file folders and envelopes. Check into them the next time you are at your favorite office supply and let me know what you think and contact me. I hope you enjoyed the October issue of Messy Makeover Magazine. I consider it a privilege that you took your valuable time to subscribe and read this magazine. Stay tuned for the next issue!